The Kuskokwim River is the second largest drainage in the state of Alaska. The glacially turbid mainstem is approximately 900 miles long, originating from the interior headwaters of the Kuskokwim Mountains and the shadows of the Alaska Range. The Kuskokwim River flows in a southwest direction to the Bering Sea. The sparsely populated Kuskokwim drainage has population centers at Bethel, Aniak, and McGrath, in addition to numerous villages along its length. The Kuskokwim is a remote area of Alaska. People usually travel by aircraft to one of the three previously mentioned hubs. There are no roads, except within the cities and villages on the Kuskokwim. Sport fisheries management is partitioned into Lower and Upper Management Areas in the Kuskokwim River drainage. The Lower Kuskokwim includes the tributaries of the Aniak, Tuluksak, Kisaralik, Kasigluk, Kwethluk, Eek and adjacent waters of Kuskokwim Bay. The Upper management area includes all water bodies upstream of the Aniak River, notably the Holitna and George rivers and many smaller streams. The majority of lands surrounding these watersheds are within either the Yukon Delta National Wildlife Refuge or the Togiak National Wildlife Refuge. Many of the fisheries in Alaska are under dual management of State and Federal agencies and the complexity of regulations can be intimidating. It is your responsibility to know the land status and regulations of your activities. Waters subject to ANILCA Title VIII (including waters in which the United States has asserted a reserved water right) are open to fishing under state regulations but are subject to federal restrictions and closures. If you are planning on fishing in waters under federal subsistence jurisdiction, you must comply with federal regulations. To familiarize yourself with the federal regulations and how they may affect your planned activity, you should contact the federal agencies. In-season closures or temporary regulatory changes can occur at any time. Because the Kuskokwim is glacially turbid, most anglers focus on the clear water tributaries. 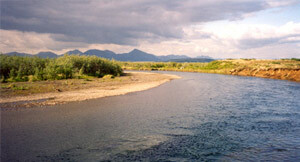 Confluence areas are good locations to intercept migrating salmon and offer day trip opportunities. Most anglers are selecting tributaries of the Kuskokwim and Kuskokwim Bay for float trip opportunities. Limited guiding services are available in the Kuskokwim. Air charter/outfitter services are available in Aniak, Bethel, and Dillingham to meet your float trip transportation needs. Many of the popular tributary float trips are over a hundred miles in length, offering remote fishing opportunities for salmon and resident fish. Depending on your timing you could catch several species of salmon and resident fish, such as rainbow trout, Dolly Varden, Arctic grayling, northern pike and sheefish. Fishing in the Kuskokwim and Kuskokwim Bay is mostly a summer and fall activity. Fishing season is open all year for most species. Ice fishing is a favorite local pastime during the winter months in the Kuskokwim area.